Popular luxury car maker – Audi is going to launch the all new Q7 on December 10 this year. This flagship SUV from Audi is a huge hit with customers and the car maker is now bringing the new Audi Q7 to Indian market. The weight of this full size SUV from Audi has been drastically reduced to 300 Kgs. Audi Q7’s light weight is going to improve the handling and performance of the car – along with an improvement in fuel efficiency. When it comes to exteriors of the car, the all new Q7 gets a very sharper look overall. The current Audi Q7 which is in the market has a very bulky appearance, the new Audi Q7 looks much leaner and attractive. The car also gets the slimmer headlights and new-taillights which are LED units. Overall, the new design language on the new Audi Q7 is just great and shall definitely lead in upcoming models. When it comes to the interiors of the car, the Q7’s cabin appears to be pretty larger. The car’s dual-zone air conditioning system is developed by Audi. The car’s air-conditioning system can be operated with the help of less buttons and controls. The car gets animated symbols as well as the capacitive toggle switches which has been used extensively through out the car. The car also gets Modular Infotainment Platform which gets integrated touchscreen system on the new Audi Q7 as well. When talking about the powertrain aspects, the new Audi Q7 would be getting a 3.0 litre Tdi engine that is mated to an 8-speed automatic transmission that comes with paddle-shifter controls as a standard option. The new Audi Q7 comes with Audi’s signature Quattro all-wheel-drive(AWD) system. The car is going to be launched in India on 10th of December. Initially the new Audi Q7 will be brought to India using the CBU route. The car maker has also shared their plans of beginning CKD operations as well – during the late next year. 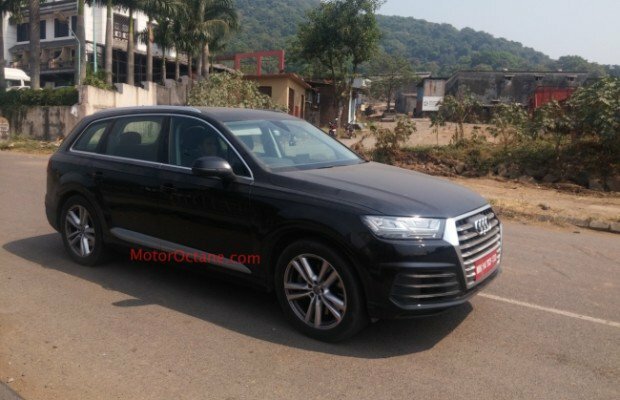 Also read: Audi Q7 spotted on Mumbai roads.